Even the sturdiest, most expertly built roads require maintenance from time to time. Proper road maintenance reduces the need for major repairs and replacement, saving you time and resources. At G&C Asphalt, we provide maintenance services for paved and unpaved roads. We can provide regular, seasonal maintenance, or address specific and occasional problems. Our focus is on planning and implementing long-term proactive maintenance programs to ensure the continued viability of our clients’ road surfaces. For more information or to schedule maintenance services, please contact us. 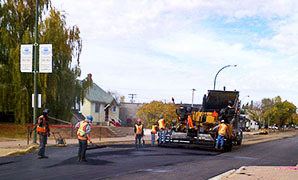 The City of North Battleford puts out a reconstruction and overlay program each year. It is a comprehensive program which involves grouping many small projects encompassing underground utilities, excavation, base, concrete and asphalt.